Many people mistakenly believe that all-season tires are equipped with the necessary traction and tread to handle any type of winter driving conditions. The truth is that although all-season tires provide a versatile performance on a variety of road conditions, these tires are not engineered to handle the rigors of severe winter weather. The tonneau cover acts as a protective barrier to all the weather conditions in this region of the country. How Does Your Transmission Work? 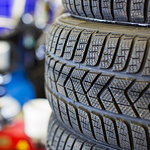 In order for your tires to move, your car has to do far more than just make the engine run. So how exactly does this happen? That is why we here at Korum Automotive Group of Puyallup, WA are here to teach you all about your car's transmission. A transmission's main purpose is to take the power generated in the motor and transmit it, with the help of other parts, to the axles of the car that help move it forward. Without a properly performing transmission, your vehicle isn't going anywhere anytime soon. Driving in the dark can be a bit of a challenge for many people. If you add rain, snow or another harsh weather condition to the mix, then the ability to navigate the road can become even more difficult. If you feel like your vehicle is difficult to drive in the dark because you cannot properly see the road in front of you, then you may want to stop down to one of our auto service locations in Puyallup, WA and let our technicians see if there is anything we can do to help improve your overall visibility. When you are planning a road trip for the holidays, do you make a checklist of things to have checked on your car before leaving? If not, you may want to add this planning tool to your routine! The checklist will help you to avoid a breakdown when on the road, no matter if it's only 100 miles or 1,000 miles away. Shorter road trips are less intense and call for far less things to be repaired, but the longer trips will need to have a checklist performed before leaving. If you attempt to stop the vehicle quickly, you notice that the vehicle begins to bounce up and down. While driving, you are smelling something burning from under the vehicle. When you identify one or more of the following warning signs, it might be time to get over to Korum's Pre-Owned Vehicles for a new battery before you wind up stranded somewhere and need a jump or a tow. If you know what to be looking for, these failing car battery warning signs are simple to identify. If you blinked, you may have missed it: summer is nearing its final chapter. Back-to-School advertisements are crowding the airwaves, and your monthly budget now includes pencils, paper and calculators. Fall kid-chauffeuring chaos is slithering its way to Puyallup, and if you happen to be one of our many used Ford or Lincoln drivers, you face the troubling reality that with school, sports, clubs, meetings and changing weather, your car’s interior will get beaten up. At Korum's Pre-Owned Vehicles, we make it our prerogative to maintain your Ford Escape or Lincoln MKC's comforting air.